We stand on someone else’s dirt. Every day we search, we scrape, we scavenge, and we fight for an opportunity to maintain our lives. Humans were never meant for this world, and I often wonder why we even exist. This world was designed for the Titans — the massive, mythical beasts that roam the land... their land. 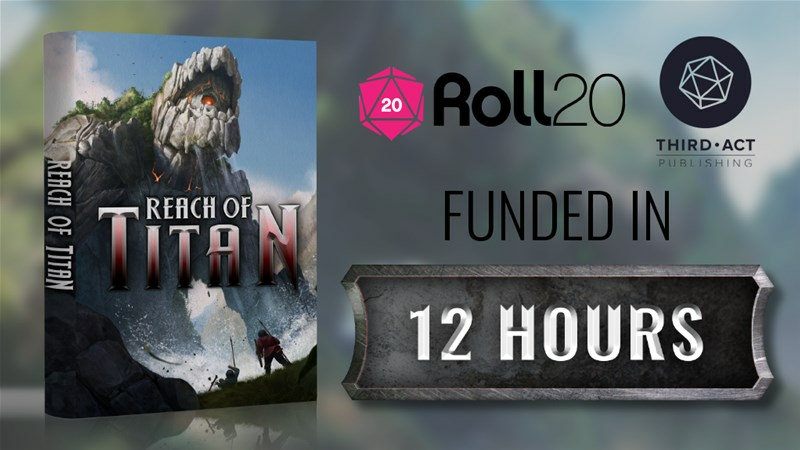 Reach of Titan is a tabletop role playing game designed to emulate fantasy style battles with giant creatures. Players take on the roll of Titan Hunters, special members of their tribe who are responsible for the safety and growth of the community. These hunters are tasked to go out and fight the giant creatures that roam the land, to feed their families, and protect what they have built. The world is dangerous, the Titans are an incomprehensible threat, but those with the will to survive, can use their talents and skills to eek out an existence. Reach of Titan will have a familiar feel for anyone who has played Shadow of the Colossus, Monster Hunter, or watched the Attack on Titan anime. The battles are designed to be half-puzzle, half-combat, where players must use more than their die rolls to bring down these behemoths. Encounters are challenging, as you must solve the puzzle of killing the Titan, while also working with the resource management system of traditional RPG combat. This combination of systems will provide play groups with a very unique game experience. The campaign's more than 2x funded with still 23 days left to go.